This is a difficult blog to write. I want to like Cambridge Common, I really do. It’s close to home and I like the feel of the place. The menu is varied and looks amazing. I have tried and tried again over the last six to eight months to like this place, but to be honest, I can’t and here’s why. It’s a loud, and obnoxious place to dine. The staff are too busy to pay attention to any of their customers, they try (and I really believe they do), but they are just machines delivering food and drinks. No matter how often I go there, I will just be a number, a strange face in the crowd. No one has time to chat, or get to know their customers and that’s a shame. All this basically relates to poor and/or slow service, water not being refilled, drinks not being reordered. It takes forever to get someone’s attention. Now onto the real issue I have with this place. The food is mediocre at best. The salads are not fresh, the lettuce often wilted and overpowered by poorly made dressings with out of balance flavors. The Burgers are never done to the customer’s satisfaction. I don’t think the kitchen staff knows the difference between rare, medium well, and well done. Every time I’ve order a burger no matter how I specify it, it comes on way – rare. I don’t like my meat bleeding, so I have to send it back, and of course this means (because of the impossibly slow service) the people I’m with are done with their meal before mine ever returns from the kitchen. The fries are horrible. They taste freezer burnt. The regular fries are always soft, and mushy with grease, and the curly fries are brittle and dry throughout. And I’m not talking on one occasion. Every time I get fries they are like this. Their fresh mozzarella sandwich might be good, but there is so much garlic in the basil pesto, you can’t taste any of the other ingredients. And I can’t even begin to describe how greasy their grilled cheese sandwich is – I just can’t go there. This is a no win situation for me, and despite its proximity to me, and their decent cocktails I will have to resign myself to finding another neighborhood restaurant to frequent. This place just won’t do. The only reason I’m giving them 2 paws instead of 1 is because perhaps there is something on the menu I haven’t tried, which is edible. I just can’t keep going back and being disappointed, so with that my friends I’m giving them an extra paw and a prayer. This post is long overdue, and a review that is entirely different than the one I would have written a couple of years ago (2014) when I first visited Changsho. That first experience was not a good one, and I’ve not been back. Fast forward to May 2016. I decide it was time to swallow my little stubborn pride and cross my paws over the threshold of Changsho once more. Instead of dinner, I did their lunch buffet, and while I don’t think everything on the buffet was great Chinese, for the most part, it was an enjoyable experience. The service was what one would expect from a buffet service, the food hot and fresh and the best part is it was only $13.00. Not bad considering what you get these days in Cambridge. The hot and sour soup was, in my opinion, one of the best I’ve ever had anywhere – paws down. It was spicy, and tart, and smoky, and everything you expect of hot and sour, plus the flavors were perfectly balanced. I only wish the soup was on the all-you-can-eat buffet because that would have been it for me. Next time I’ll just buy the entire pot of soup and call it a day. The vegetable tempura was deep fried to a light crunch and didn’t hold any of the grease you sometimes get with fried food. The kung pao chicken was cooked to perfection with tender slices of chicken in a delicious brown sauce, and the best part…it wasn’t so spicy that you couldn’t taste the ingredients. My only complaint was that the dish was a bit on the greasy side. The vegetable fried rice and lo-mein noodles were well prepared and packed full of tender vegetables, but again left you with a slight greasy feeling. My least favorite item was the pot stickers. I was hoping for vegetable or even pork, but no it was a big chunk of tough beef inside the perfectly seared wonton wrapper. I’ll pass on that next time. Overall, my experience with Changsho was a vast improvement over my first impression two years ago. Will I be back? Absolutely. Changsho is not a fancy place, and it may not be the most authentic Chinese food, but for Cambridge, it’s pretty good. I’ve walked by McCabe’s on Massachusetts Avenue more times than I care to count, and every time I do I think, “I should try that place.” So when friends of mine suggested we go there for dinner I was like, “Finally!” And final it will be. Upon first entering, it seems like a quaint, albeit very busy neighborhood joint. We were greeting with warm smiles and immediately taken to our reserved table for eight. From there on, the evening went down hill. The waitress, stood at one end of the long table, making it difficult for any of us at the other end to hear what she was saying, she seemed put-off when others asked her to repeat herself. I will preface this next comment to say, that this gathering of friends was sort of a reunion so there was lots of catching up, so we didn’t get around to ordering our dinner for about an hour. When we did, however, the waitress informed us of several of the menu items were either out, or running low. Really? Couldn’t you have told us sooner? I can understand perhaps running out of a nightly special, but running out of your regular menu items is something only done by amateurs or poor budgeting and planning. So the dish I wanted was no longer available. My hamburger, was dry, tasteless, and came with only 3 pieces of wilted lettuce. No tomato, no onion, no mustard, or ketchup. I choked down half of the sandwich and gave up. One of my friends didn’t get the food she ordered, but gave up waiting and ate what they mistakenly brought her. The gnocchi was overpowered by the truffles, to the point of not being able to taste the squash or brussels sprouts. The mushroom pizza was so heavy with garlic and grease it was inedible and remained untouched, except for a couple of bites. And if all this isn’t enough to turn you away, we ordered a slice of cheesecake for dessert. It was deep-fried! Hello, there! Nowhere on the menu did it mention this. The breading used made it takes like we were biting into Southern friend chicken, not something sweet for dessert. It like many of the menu items was half-eaten. There are a few redeeming features I should mention out of fairness. They have amazing French fries. They were crispy on the outside (skin-on) and soft and tender on the inside, and perfectly seasoned. The other two highlights of the evening were the cheese plate and house-pickled vegetable platter. My advice to you, go for the drinks, and a couple of appetizers anything, which doesn’t require much in the way of kitchen labor. If you want to try their regular menu go early if you won’t want the kitchen to run out of food. There are a few places in Cambridge that have always been my go to place when I want good reliable food. Daedalus was one of those places. The food isn’t fancy, and it isn’t pretentious. That’s what I liked about it. Yes, you did read the past tense correctly, and for very good reasons. Now I need to preface this by saying that it’s been a while since I was here. 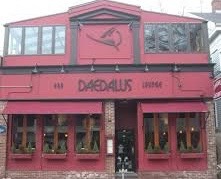 Perhaps a year or more, but I just always thought Daedalus was always going to remain true and not be one of those restaurants that try to “reinvent” themselves. This reinvention failed miserably in my opinion. I knew something was askew when I walked into the restaurant and was greeted not with the smell of steaks, or burgers grilling, oh, no. It was garlic. The entire restaurant reeked of it. I probably would have walked out and gone elsewhere, but I was there to meet friends, so I lingered at the bar and waited with a very strong cocktail. I ordered the Chicken Kabobs with vegetables and couscous. Of course, if I would have been blindfolded I would never have known what I was eating as everything tasted like garlic. There was no discernable difference in the taste between the chicken, the green pepper, or the onion. I’m sorry, I may be unique here, but I like to taste the various flavors of my food; the sweetness of the peppers, the smokiness of the grilled onion, and yes the flavor of the chicken – shocking I know. The risotto was just as bad as the kabobs. Yes, I know risotto has garlic in it, and I’m totally fine to use garlic as a subtle flavor in the background. Again it’s about the balance of flavors. But there just isn’t any balance in anything. It’s all one note, garlic. I have always been a firm believer that the only reason to douse your food with garlic is to cover up the fact that you are not serving fresh, flavorful food. Why else would you want to disguise the subtle nuances of food? It’s the blending of flavors that make good cooking, truly good cooking. And here is where Daedalus fails. There is no point for me to go and pay twenty dollars for a meal and only taste the garlic. The only reason I’m giving them 3 paws is that the wait staff is fantastic. The service is top notch. You’re actually treated like someone, not just another possible tipper. At least they are still doing this part of their business right. Okay, I must confess something to my constant readers. I’ve been hiding a secret from the world. I know it’s a terrible thing I have done, but I just didn’t want the news to get out about this little gem of a restaurant called, West Side Lounge. I wanted it to remain my secret, but I can’t hold back any longer. I must share my absolute love of this place. Picture a dimly lit restaurant, beautiful décor, local artist’s works hanging from the walls, a menu that doesn’t have one bad item on it, and a staff that treats you like you’re part of the family. That’s West Side Lounge. My most recent visit was no exception. The waiter, sometimes bartender, sometimes host, Jeff greeted us with a warm smile and a handshake. He’s one of the reason’s I keep coming back. He’s a sweetie! I ordered my usual margarita and they know just how I like it, silver tequila, straight up, and no salt. This night, I ordered the Edamame Fritters and Favorite Chicken Ever (that’s the name of the dish, and there’s a reason why it’s call this). The chicken is always juicy and cooked to perfection. It’s sitting on a large bed of goat cheese whipped potatoes, which is sitting in this warm, silky gravy with mushrooms and artichoke hearts. It really doesn’t get any better than this. In all my years of traveling and eating at restaurants, I have never come across a place like West Side Lounge. The food, the cocktails, the service is always spot on, never changing. You know what to expect when you walk in the door. There are a lot of place in Cambridge in Boston to get great food, but it usually comes with attitude, arrogance, and a price. But not here at West Side Lounge, it’s some of the best food Cambridge has to offer with none of the pretension. And when you go, say hi to Jeff. He’ll treat you right. Massachusetts Avenue between Harvard Square and Porter Square has been, in my humble opinion, lacking for years in the area of good reliable restaurants. Don’t get me wrong there are some great restaurants along those miles of Mass Ave., but the terrible ones have for too long outweighed the good ones, but now the odds are shifting. In comes, Mix It Sushi Noodle Grill. I must admit that I was a bit hesitant at first. The name alone brings visions of too many menu items to do anything well. I will be the first to admit and proudly so that they do it and do it like no other. The sushi is always fresh and always beautifully presented. And for you vegetarians out there they have an amazing assortment of vegetarian rolls. My personal favorite is the Veggie Combo #2, which includes an asparagus roll, veggie salad roll, and a sweet potato tempura roll. On one of our bitter cold evenings between two snowstorms I slipped on my little boots and trudged through the six foot snow banks to get something warm to eat. Crazy I know, but this place is worth it. I ordered the Pad Thai with vegetables. Now Pad Thai has been a staple in my diet for many years and in many of my travels, but this without a doubt was one of the best Pad Thai’s I’ve ever had. Everything was cooked to perfection. For you Cantabrigians who have not been here yet, shame on you. You won’t get this quality of food or great service in too many places around town. If you’re visiting, make the short walk from Harvard Square. Do what you have to, but pay a visit to Mix It. You won’t regret it.